I know that there is a lot of tragedy that happens every moment of every day in the world. I am so thankful that God is aware of and feels the pain of every tear that falls. Today, I am mourning with the family of Steven Curtis Chapman. One of the little girls that the Chapman family adopted from China died in an accident at their home. See the story here. I just recently spent a week in China and while I was there I thought of the Chapman family and of the three little girls that they adopted from China. I don’t personally know the Chapmans, but I do know of their wonderful adoption ministry through Shaohannah’s HOPE and I have been greatly blessed and inspired by Steven Curtis Chapman’s music over the years. I have two daughters. I have spent many a Saturday and Sunday morning holding my little girls in my arms and dancing with them around the living room to the music of Steven Curtis Chapman. Today, I am praying for and mourning with the Chapman family. On Wednesday afternoon Jason Cooper and I took a trip into the inner city area of Guangzhou that I will never forget. With the help of some of the local Chinese people that were in attendance at the conference that we were participating in, we got some taxi directions to a very traditional and poor part of the city of Guangzhou. The taxi driver seemed a bit hesitant to take us to this portion of the city. It wasn’t an issue of safety as much as it was not a common place that foreigners wanted to visit. He kept saying that he would drive us around because the streets were very dirty to walk around on. He was right, the streets were very dirty, but we got out and walked around. It was amazing to see the life of the Chinese people go on all around us. The streets were very narrow, the shops were tiny and there were people everywhere. People were buying, selling, delivering, carrying, talking, playing cards, sleeping, playing with their small children and playing with their pet cats and dogs. The people did not seem to care that we were walking around their neighborhood. Life was too important to stop and gawk at some out of place foreigners. It was apparent that the people in the community that we visited were very poor, yet not a single person asked us for money or tried to push us into buying something from them. Some of the narrow streets and alleys that we walked down allowed us to get a glimpse into the living conditions of the people in that portion of the city. Many of the living spaces were a single room that was only eight by eight feet square. We saw families huddled together in these small rooms, sitting on the floor eating dinner, talking and…laughing. The houses and buildings that the people were living in were extremely old and very run down. It was hard to believe that some of buildings were still able to stand given their condition. After seeing the deteriorated buildings in Guangzhou it is easy to imagine how so many people could die in a large earthquake incident like the one in Sichuan, China. There was an element of simplicity and survival in the people and the place that we visited and their lives and situation had a profound impact on me. The people had so little yet within the area that we visited there was a distinct sense of community and the people seemed happy. On Wednesday afternoon Jason and I had a break in the conference in the afternoon and instead of going to our rooms and taking naps we jumped in a taxi and went to one of the “innermost” parts of the city of Guangzhou. This was an area of town that was indicative of the way that most of the people in the large Chinese city live in daily life. This was not a tourist area—there were no souvenir shops nor were there any tourists or foreigners to be seen in the area—except for us. In a later post I will share some more pictures and comments about what we saw and experienced in our visit to this very fascinating place. The taxi ride to this area of town took about forty minutes. Along the way there were lots of sights to see. Above is a picture I took from the taxi that gives you a tiny idea of the huge volume of people that live, move and have their being in the city of Guangzhou. The picture is not one of a group of people that are just getting out of a stadium after attending a crowded concert or sporting event—they are just people that are walking and riding their bicycles to and from work and/or home. In our visit to the “inner-city” of Guangzhou we did walk through some local market areas where they were selling lots of interesting things that were associated with oriental medicine. There were bags and bags of dried leaves, stems and roots, and there were all kids of strange and pungent smells associated with the products. We passed by more that one outdoor shop where a person was sitting smoking something out of a very large, three foot long bamboo pipe. The people smoking the large pipes looked very old but at the same time rather healthy. I am sure it is good for you. Posted in this blog post are some pictures of some of the items that we came across that were for sale at the oriental medicine markets. For a very reasonable price we could have purchased some dried lizard skins, a huge bag of dried seahorses, and a bundle of dried snake skins. These were just a few of the very unique things that we found for sale in the market area. One shop that we came to was filled with all kinds of large jars and even some huge vats. Upon closer inspection we found that the huge vats were filled with dead pickled snakes. The vats were covered with transparent glass tops and it was surprising to see that the snakes were HUGE. Many of them looked to be five to eight feet in length and about three to four inches around in diameter. They were all dead but it was a bit creepy. 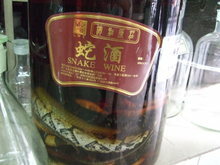 The girl in the shop took us over to a display case and tried to sell us a bottle of wine—snake wine. It was tempting... but we said no and quickly moved on down the street. The city of Guangzhou is a place of contrasts. The roads are filled with expensive luxury cars but the sidewalks are even fuller with people walking, pulling carts and riding old bicycles that are rigged to carry loads of wood, water bottles, boxes, etc. The trees, flowers and vegetation in the city are green, beautiful and tropical in nature but the skies are a gray/brown color and the sun is hidden behind a think blanket of unregulated pollution. The retail prices on food and other items are seemingly low and advertisements are alluring yet the expendable cash of most of the people seems to be even lower. Money and time is not wasted on extravagant things and treats. This is quickly evident to me as I observe the street sweeper methodically do his job in the front of a relatively empty Starbucks coffee shop. The poor, run-down, crumbling houses and apartments cower in the shadows of the new glass and steel skyscrapers all around them. Both of them in their differences speaking loudly of an ideology that looks good at the outset and works well for a season, but over time deteriorates into ruins. Tuesday was a busy and good day for us here in Guangzhou. Jason and I made our presentation to the conference attendees on Tuesday afternoon. We spoke about the history of Christianity in South Korea, the current state of Christianity in South Korea particularly within the context of Christian Education and we each shared a bit about our schools, Taejon Christian International School (TCIS) and Gyeonngi Suwon International School (GSIS). It was fun sharing about our experiences and adventures in South Korea. Speaking of adventures, this city of Guangzhou is a never ending adventure. On Tuesday we went and visited a nearby university campus and enjoyed a walk around the huge campus of over 30,000 students. Education is a very important thing to the Chinese people. From one of the taller buildings on the campus I got a good picture of just a small part of the freeway overpass system that is here in Guangzhou. At one point in our travels through the city we were traveling in the top lane of a four road, stacked overpass system. When the road system is not able to meets the needs of the huge city they do not have room to widen the road, rather they just build another lane of traffic that runs parallel to the previous road. It is amazing. On Tuesday evening we went to a downtown shopping area and had some of fun walking through the shops, seeing the huge crowds of people and even buying a few things at very cheap prices. There was never a dull moment while we were all shopping as the store merchants were merciless in their efforts to get our attention and encourage us to buy products from them. The city of Guangzhou is huge, with a population of 15 million people. The city seemingly never ends. However, it is just a small drop in the bucket compared to the country of China which has a population of 1.6 billion people. The two primary languages used in China are Mandarin and Cantonese. Here in Guangzhou the primary language is Cantonese and the primary type of food served here in this city is Cantonese Food. We are eating all of our meals while at the conference in the hotel dining room and we are eating lots of delicious Cantonese food. The variety is amazing and each meal usually includes about ten different entrees that are served in the family style manner. On Monday evening we boarded a bus and went downtown to participate in a river night cruise of the Pearl River. It was quite an experience. The Pearl River is a very large and polluted river that runs through the center of the city of Guangzhou. The river is lined with lots of elaborately lighted sky scrapers, office buildings and it is crossed by many unique bridges. It was a lot of fun to sit on the top outer deck of the river tour boat and drink tea and eat watermelon while enjoying the lights of the city and the good conversation of some very interesting people from Australia. On Monday of the conference we spent the day listening to presentations from various individuals from Christian schools from all over the world. It has been so inspiring and such a blessing to hear of God’s working in places like Canada, France, Africa and Romania. I was particularly impressed with a presentation by Daniel Neuhaus from France. France is a place and society that has all but shut God out. However, Daniel and others continue in prayer and service to God within the context of churches and Christian schools and they are shedding the light of Christ in a very dark place. Marcus Chibisa from Zimbabwe, Africa shared about his service for the Lord at Gateway Christian school. His story was a strong testimony about the role that a Christian school can play in the lives of individuals and a community. Marcus was imprisoned for his faith for one year in the 1970s and he praises God for the experience as he was able to share Christ with his fellow prisoners and he feels the experience gave him strength and skills to serve as a Christian leader in his country. The conference is an experience that is hard to explain. The connections that are being made between Christian people from around the globe are amazing and hold great potential to further the work of Jesus Christ in the world. After Jason Cooper and I settled into our hotel on Sunday afternoon we went on a little trip to a downtown area that we had spotted earlier. We pulled out a little bit of RMB (the currency here in China) and we jumped in a taxi. The traffic here is a bit crazy and the taxis are ok except for the bars that they have up between the driver’s seat and the rear seat passengers. We had a good time walking around the shopping area. We saw lots of people in the mall that we visited and we even found a Starbucks and bought a Guangzhou collector cup. As we walked along the street we were both overwhelmed with the volume of people that filled the sidewalks. They don’t seem to pay much attention to us foreigners (except for the street vendors). The weather here in Guangzhou is in the 70s and it is a bit muggy. The skies are tainted with the gray-brown haze of pollution. The conference began for us last night as all of the participants gathered for dinner. There is about forty people from all over the world in attendance at the conference. We had a great meal of Cantonese food and we had a wonderful time of fellowship. The people that sat at our table for dinner were from Africa, Australia, France, Hong Kong and…Idaho, USA. I arrived in Guangzhou, China around noon on Sunday. I (Ryan) am here attending an educational conference with Jason Cooper, the assistant principal from Gyeonggi Suwon International School. The city here is huge. It took us quite awhile to travel in a taxi from the airport to our hotel. We drove for a solid hour at a high rate of speed through a city full of tall office and apartment buildings. As you probably know, China is a Communist country and there was evidence of this even as we drove to our hotel. The extremes in economic status here are stark in contrast. The buildings and apartment complexes are either opulent or very poor and run down and they exist right next to one another. The roads are not filled with many cars but the cars on the road are composed mainly of very expensive luxury cars. The sidewalks are filled with people--walking where they need to go. I tried to check my blog(s) on the internet connection that I have in my hotel room and I couldn't get connected to them. I did some checking and found that China uses a firewall to block out many of the primary blog providers. I suspect this is an effort to suppress any form of freedom of speech that might reveal some of the things going on in the country and to discourage any online movements from within the country. InterestinglyI I was able to get to my posting site and type this blog, even though I can't access my actual blog page. We'll see if it gets through. If you are reading it, it got through. I will try to attach at least one picture. We'll see if it gets through. All in all, China is a fascinating place and I am looking forward to my time here. I will keep you posted as I am able.